The board of selectmen received an economic development update from Town Manager Robert LeLacheur as part of its regular meeting on September 26. During the update LaLacheur shared that discussions have been underway for a shared Reading-Wakefield DPW facility to be built at Camp Curtis Guild, the Massachusetts National Guard training base located on the border of the two towns. LaLacheur reported that Wakefield is “all in” on the idea. Negotiations are in the very earliest stages with several stakeholders, including the Massachusetts National Guard and the United States Army, needing to agree on the plans. A preliminary meeting was held in the state house office of State Representative Bradley Jones which included Jay Ash, Massachusetts Secretary of Housing and Economic Development. Ash reported that Governor Charlie Baker is very interested in finding opportunities such as this where state owned land can help benefit municipalities. LaLacheur suggested it could take close to five years to get a facility built. 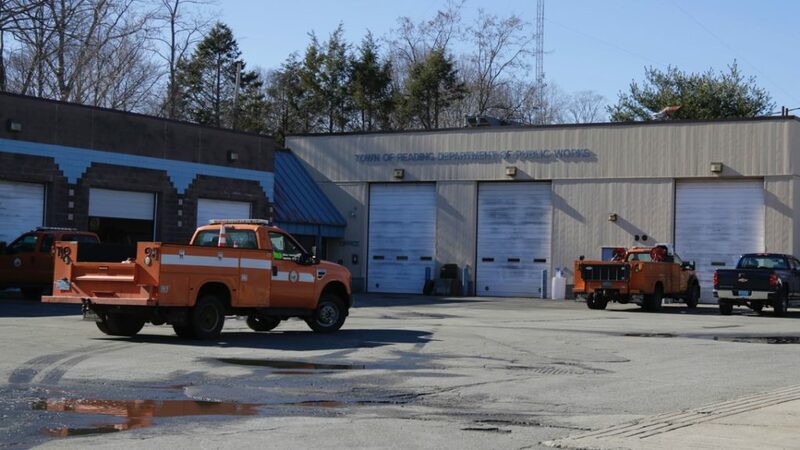 The board of selectmen hope that the property on which the current DPW garage sits could be put together with adjoining properties to create an economic development opportunity for the town. During the public comment portion of the meeting, several residents questioned the process and choice of the newest members of the Board of Health, who were appointed by the Selectmen at the September 5 meeting. The comments, which were tense at moments, asked for specific explanations as to why the choices were made. Chair John Arena explained that the need for the board of health to meet and appoint a health agent to be present for the Fall Street Faire made it necessary to appoint on that evening. There were four applicants for the one position. Two, Kevin Sexton and Heidi Pfeifer, were interviewed before the September 5 meeting and one, Nancy Docktor, is currently an associate member of the Health Board. Emmy Dove could not make an interview that evening. Upon the resignation of Beth Shurland, announced at the Selectmen’s meeting on September 5, both candidates who were interviewed were appointed. Arena went on to explain that he hoped Dove would be willing to serve as an associate member. The selectmen closed the warrant for November’s Subsequent Town Meeting. There are ten articles on the warrant, highlights of which include an article to fine tune the town’s marijuana regulation to bring it into compliance with state law and an article with 22 parts which seeks to clean up discrepancies between the town’s bylaws and it’s new town charter. There is also an article brought by the Climate Advisory Board which seeks to regulate the retail use of plastic bags at town businesses. The selectmen also approved revised parking regulations on Woburn Street at the site of the new Schoolhouse Commons development. The board approved an amended lease agreement for the soccer field at 75 Pearl Street and had a discussion about how best to analyze and disseminate the data from it’s recent online survey. The meeting adjourned at 9:50pm.